were you to be so foolish as to crack an egg on the bonnet of any motor car parked by the roadside in bowmore, or any other location on scotland's west coast, there's every likelihood you'd be either arrested for a variation on disturbing the peace or have to face off with an irate car owner. in fact, i'm not so sure the same wouldn't be the case in warmer climes, but one thing that wouldn't result in the northwest would be a fried egg. for the simple reason, the temperature rarely, if ever, rises high enough to cook ice cream let alone scramble some eggs. here, in the land of no hosepipe bans and reservoirs that you could sail a calmac ferry on, one thing you are unlikely to hear is the noise of folks complaining about the unbearable heat. stand at the side of a highland single track road as one or two of the pelotonese pass by, you're more likely to hear discussion of the current weather outlook or just a moaning drone directed at the substantial quantities of precipitation playing havoc with forward motion. even if you can distinguish any form of the spoken word above the splattering of rain on their panniers. and one associated feature of cloudy skies and pouring rain has to be an often not insubstantial reduction in temperature. i mean no disservice to visitscotland, and wish not to dissuade eager participants in the act of holidaying in the scottish region. i am appeased at the thought that likely few holiday this far north in search of a suntan. scotland has other attractions that outweigh the perceived disadvantages, but that doesn't mean that in the interim, it has become any warmer. it must, at this point, be observed that i have perennially scoffed at the naysayers who aver that it is surely too cold for any sort of venture in the saddle. as we all well know, it is often merely a case of pedalling a smidgeon harder than usual, coupled with ownership of appropriate clothing for inclement weather. it is prudent, however, to look beyond the act of pedalling and consider one's comfort or pending discomfort should a mechanical befall the more intrepid amongst us. if i take the route well travelled, incorporating the belgian road heading towards the blue-doored cottage at saligo, i am as far west as it is possible to go without leaving islay altogether. the sandy beach is the mediator between scotland and the atlantic. as i know to my disfavour, this ocean has vast stores of bicycle shifting winds that can push the hapless cyclist closer to a roadside ditch than is truly comfortable, and in those circumstances it is an ideal to be clothed in apparel that is the equal of the elements. last year's festive 500 was graphic demonstration. twice. that part of the equation is now, however, of historical note. though my investigations have uncovered a british summertime lasting only eight days from 7:29 on june 20th until presumably a similar time on june 28th, we are in the throes of well nigh everyone's spring/summer clothing range, and if nothing else, the photos that accompany the release of such clothing (though often snapped in continents of warmer hue) are geared towards encouraging and fomenting regular wear of many a lightweight jersey or shorts. rare is the manufacturer that offers a long-sleeve jersey for mid june. 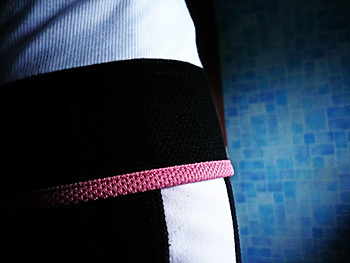 rapha have, to all intents and purposes, fostered adoption of the sportwool jersey in both long and short sleeve variants, a factor that has built them the domain they now occupy with pride. prior to their emergence in 2004, the majority of the garment offerings not only imitated the professional peloton in terms of design, but often in the manner of their polyester construction. many have followed suit with similar sportwool offerings, some of which have stretched that degree further and inhabited the pure merino stance. both sportwool and merino have fabulous properties to benefit the sartorially and technically aware cyclist, but what if those catalogue photos have brought a greater degree of sunshine to your cycling life? that's when a more lightweight covering might come in handy. perren street has not rested much over the last eight years; there have been refinements along the way, augmented by some interesting developments, one of which was the lighter weight offering of the sportwool jersey, providing many of the advantages that sportwool can confer besides benefiting those afflicted by heat. as stated in my opening gambit, the west coast of scotland is rarely the location in which an entire wardrobe of the fabric is likely to be found, but that does not discount finding the occasional well-chosen example. 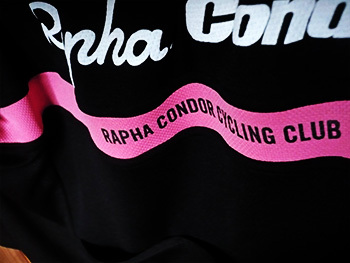 several days ago i was wont to wax lyrical over the existence of the inestimable rapha condor cycle club, whose existence is solely to support the lads under the guidance of john herety. rapha and condor are big boys now and perfectly capable of supporting themselves. 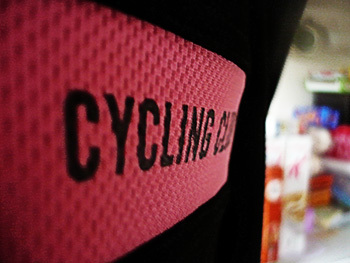 members of this exclusive yet openly inclusive club can avail themselves of a black and pink club jersey, one which surely can be regarded as amongst the finest available to any cycle club in the land. by strange coincidence, this jersey is constituted from lightweight sportwool and it seems an apt point at which to discuss its merits and demerits in public. 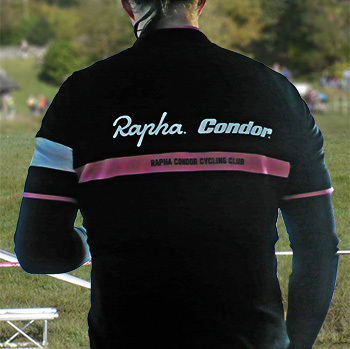 as yet, i have had no opportunity to ride bare-armed, displaying to all and sundry the words rapha and condor both front and back, just above that recognisable pink hoop paying witness to the aforesaid cycle club. the outer surface bears recognisable similitude to a series of perforations across the length and breadth of the fabric, and that hoop is not printed, but sewn in place. if nothing else, quality is rarely far from the surface. there are the usual three rear pockets capable of swallowing a colnago c59 whole, the outer two scalloped towards the outside and the right rearmost bearing an all but concealed zip for the inclusion of life's small valuables and coffee money. this particular example features a full-length zip, as does the more regular offering of the lightweight jersey, a zip which terminates safely in the ubiquitous yet welcome zip garage. it is, however, the wicking properties of the jersey that make it a particularly apt choice under a rainjacket or even - as during this past weekend - under a pro-team jacket topped with rain jacket. i had, at the time, figured i may well have been overdressed for the occasion, and though the temperature lowered as the morning progressed, it's a factor that never reared its ugly head. admittedly its appropriateness for the occasion presented itself in surprising fashion; i think it likely many purchasers of the rapha lightweight jersey will have succumbed to the marketing nous that encourages the belief that this is the ideal way to the sun, and who would blame them? however, for those bereft of regularly intense sunshine, it is surely iniquitous that we be so disenfranchised. with no intended sense of irony, what if we want to join the club too? £105 may be a tad more than it is desirable to spend on a jersey only seeing the light of day (no pun intended) once or twice a year, but taking into consideration its apparent hereby discovered versatility, new opportunities appear. it might be a prudent choice at time of purchase to acquire a pair of armwarmers or armscreens to extend the jersey's versatility even further, but that's a choice that will vary depending on climate. it can also be successfully and more insouciantly worn over a long-sleeve baselayer. though i did sort of half-promise a discussion of perceived demerits, it both grieves and delights to say that, as yet, i have found none. even the flap that sits behind the full-length zip seems intent on remaining interference free; not once have the two had conversations with each other. and though i have road-tested an arguably more iconic and exclusive variation on a theme, whether you are domiciled midst glorious heat, or chittering in the highlands and islands, this is a jersey that can look you in the eye and justify every one of its hard-earned pound notes or dollars. the race is now on to see which of you is the more demanding. 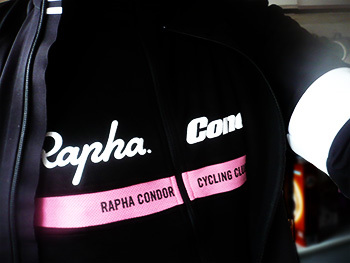 rapha's lightweight jersey is available in blue or cream or, for members of the rapha condor cycle club, in black with pink hoop. price for the former is £105 with sizes ranging from xs to xxl.